Global warming is melting parts of the polar ice caps, according to Jerome Mitchell, an Elizabeth City State University student who recently returned from a research trip to Antarctica. "We determined that there is some melting on the West Antarctic Ice Sheet" because of global warming, Mitchell said. Mitchell, 21, returned last week from Antarctica where he has been since December researching global warming and its effects on the earth. His research was sponsored by the National Science Foundation. "It was priceless," Mitchell said of the experience. 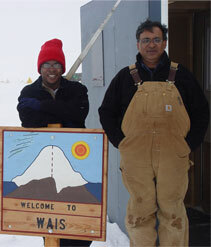 "Not too many people can say they've been (to Antarctica) and conducted research." Global warming theorizes that the Earth is gradually becoming warmer because certain gases, known as greenhouse gases, are trapping the sun's heat within the Earth's atmosphere and causing a greenhouse effect. According to Mitchell, scientists have determined that the Earth's average temperature has risen 1 degree Fahrenheit in the last century because of global warming. Some scientists speculate that global warming could lead to a dangerous increase in sea levels as the polar ice caps begin to melt. If so, an increase in sea levels in the Atlantic Ocean could threaten the North Carolina coast, Mitchell said. 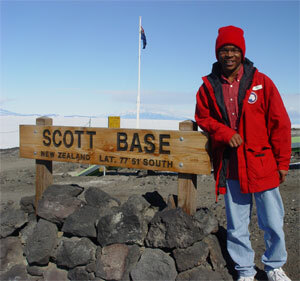 Mitchell, who is studying computer science at ECSU, departed Norfolk, Va., Dec. 18, 2005, and flew nearly two days to McMurdo Station, Antarctica. From McMurdo Station, he traveled another three hours south to the West Antarctic Ice Sheet, where he camped with approximately 40 other researchers from around the world. Mitchell worked with researchers from the United States, Russia, China and New Zealand. He said he learned a lot from working with the other researchers and plans to stay in touch with some of them. Mitchell worked between 10 to 15 hours a day gathering ice data in temperatures as low as -30 degrees centigrade (-22 degrees Fahrenheit). The sun remained fixed in the sky and reminded Mitchell daily that he was in one of the world's most remote corners that rarely, if ever, get dark. "The sun never sets" in Antarctica, he said laughing. However, it didn't take long for him to get accustomed to the absence of night. "At first it was a little difficult, but when you're working you get used to it," he said. Those long work days made it easier for him to sleep, which he did mostly in a tent. Once, though, he slept in an ice trench. Originally, he was supposed to use a robotic rover to test the density levels of ice sheets to determine if the ice was melting. But the robot's mechanisms froze in the harsh, wintry conditions and became inoperable, he said. Instead, Mitchell was assigned to oversee a computer program used to collect field data. "I was responsible for operating the software for the plane-wave radar," he said. The radar measures the annual accumulation of snowfall, he said. One of Mitchell's duties was to ensure the radar was calibrated to the satellites that relayed pertinent data to researchers at the camp. The software was similar to the software he uses at ECSU. 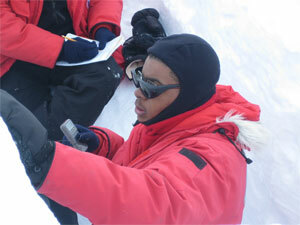 His experience in Antarctica taught him valuable life lessons, Mitchell said. "I learned to deal socially and mentally in that environment," he said. Mitchell traveled to Antarctica with students from the University of Kansas, where he spent the last two summers conducting polar ice research. ECSU, the University of Kansas, and other institutions, received a $26 million grant last year from the National Science Foundation to conduct a joint study of changes in the global climate. ECSU's share of the grant was $2 million.